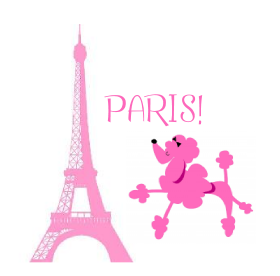 Pink Poodle in Paris birthday theme ideas. Fun Pink Poodle ideas for birthday party invitations, decorations, games, activities, food, goody bags and favors. Blank invitations with a picture of Paris related things such as Eiffel tower, picture of Paris, or a Poodle. Pink and white note cards - embellish with any of these glued around the top edge - boa feathers, small pink pom-poms, curly ribbon, mint green polka dotted ribbon. Postcards of Paris - write party information on the postcards back. Note cards embellished with Paris themed scrapbook paper. Centerpiece ideas: Pretty glass vases filled with pink flowers - attach white, black or mint green boa feathers around the top of the vase. Fill vases with pink rocks or marbles. Or tie helium balloons to Eiffel tower statues and place them around the table. Since Paris is the "City of Lights" hang lots of strings of mini lights around the party room and table. Place maps or pictures of Paris and posters of the Eiffel tower around the room. A fun activity for a Pink Poodle in Paris themed birthday party is to hire a Mime to perform or have a caricature artist draw guests portraits during the party. Dog Bone Treasure Hunt - This is a fun treasure hunt and fits in perfectly with the Poodle in Paris theme. Guests hunt to find hidden dog bones with a number on it. The number corresponds to prizes - when they find a bone with a number they will turn it in for a prize. Make pink dog bones by tracing a dog bone shape onto pink poster board or card stock. You will need at least 3 x the number of guests you are expecting. Before the party hide the dog bones around the party area or if it's nice outside around the yard or park. You can make more bones without numbers to hide also - kids love this game and want it to last awhile. Charity Animal Shelter Scavenger Hunt - If your child would like to help out the local Animal Shelter this is a fun activity to get everyone involved helping local poodles. The object is to go around the neighborhood (make sure there are adults with the children at all times) and ask neighbors for items they would like to donate to the animal shelter. You can make this a competition and send out 2 teams - one team takes the odd number houses the other the even number, or send everyone out together. See the Animal Shelter Scavenger Hunt List - it's free to print out. This is played like Pin the Tail on the Donkey. Find a large poster or draw a pink poodle on a large poster board and hang it on the wall. Buy large pink pom-poms and attach double sided tape to them. Give each party guest a pom-pom and one by one blindfold them, turn them around and then tell them to stick the pom-pom on the poodle. Depending on your poster determine where you want the guests to put the pom-pom (head or tail), mark it and the winner is the one who "pins" their pom-pom closest to the mark. Buy a good sized statue of the Eiffel Tower and place it on the floor. Find plastic rings, or make from cardboard and paint them pink, that are large enough so they fit over the top of the Eiffel Tower with plenty of room. Have guests stand back from the Eiffel Tower, about 7 feet, on tape you have placed on the floor. Each guest gets 3 - 5 tries to throw their rings on the Eiffel Tower. You can change it up by starting close to the Tower and then each round moving them back a few feet. This game is played like the classic Egg and Spoon race. You will need 2 wooden spoons and 2 large pink pom-poms. Divide guests into two teams. Have them line up at one end of the play area and at the other end have 2 orange (or pink!) cones that they will have to run around before they can go back to their team. Have guests place the pink pom-pom on the spoon. They have to run around the cone and then back to the line to hand the spoon off to the next person. If the pom-pom falls off the spoon they must pick it up, run back to the front of the line and that person must start again. First team to finish wins! If you can find some cute new plastic dog dishes you could serve the cake and ice cream in them.